Internationally acclaimed artist and fashion designer Jeffrey Mayer presents an exhibition of 20th and 21st-century fashion design inspired by the 18th-century fashion aesthetic of Marie Antoinette. Although Marie Antoinette did not really create a style that was personally unique, what she did for fashion in the 1770s was to solidify, refine and intensify the rococo style created by Madame de Pompadour, favorite mistress of Louis XV. Madame de Pompadour died in 1764, 6 years before the 14-year-old princess had even arrived from Austria, leaving a rich legacy for future queens. What Marie Antoinette added to her style predecessor’s vocabulary were the concepts of Fantasy, Luxury, and Exoticism. Fantasy ruled in the court of Marie Antoinette as the often-bored queen of France looked to extreme fashion for diversion. Inspired by the shepherdesses in the fields around Versailles and village life, Marie Antoinette created a fantasy version of farm life, starring herself as the chief shepherdess in elaborate silk gowns and heavily embroidered aprons. Hairstyles also defined fantasy, the top coiffeur, Léonard, created the pouf, or extremely tall beehive hairstyle made of wire forms, backcombed hair, and hair extensions. These confections were trimmed with live birds in cages, fresh flowers, miniature scenes and models of ships in sail. Luxury was achieved for Marie Antoinette through the use of the finest fabrics, laces and embroidery that France could create. Designed and overseen by the queen’s own Minister of Fashion, Parisian dressmaker Rose Bertin, no small detail was left unfinished. Exoticism was promoted by Marie Antoinette as her mother, queen Maria Theresa of Austria, sent books and trinkets imported from around the world. Through these exotic gifts, Marie Antoinette became well read and worldly. Asia, Africa and the Americas provided inspiration and amused the queen, who incorporated the new forms and motifs into decoration for fashion and furnishings at Versailles. As a result, pagodas and leopard print began creeping into the rococo vocabulary. Marie Antoinette began as a small exhibition at Syracuse University’s Fashion Design Department, where Jeffrey Mayer has been Associate Professor of Fashion History and Design since 1992. For the Everson’s exhibition Mayer has expanded the visual experience to include 48 mannequins painstakingly styled and accessorized with 20th and 21st-century fashion designs created by American and European designers. Mayer spares no detail with over-the-top designs and highly embellished accessories including delightful fans with interactive audio messages placed throughout the exhibition for viewers to discover. The models are tightly grouped to create mini-narratives inspired by the anything-but-ordinary life of Marie Antoinette. "Written to accompany the High Fashion museum exhibition 'Marie Antoinette; Styling the 18th Century Superstar', created by stylist and fashion designer Jeffrey C. Mayer for the I.M. Pei designed Everson Museum of Art in Syracuse, New York. 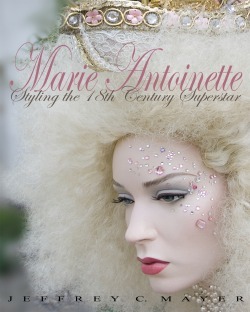 This book discusses the style impact that Marie Antoinette had on fashion in the 18th century, and how those style aesthetics can be applied to 20th and 21st-century fashion. The book is filled with photos by photographer Stephen Sartori, and styled by Jeffrey Mayer, using mannequins by Adele Rootstein and Patina V to depict vignettes inspired by the anything but average life of this young queen of France showcasing American and European couture from the 1950's to the present, including work by Valentino, Chanel, Balenciaga, Norell and Scaasi. The layout was designed by graphic artist Todd Conover who takes the reader on an elegant journey through this eclectic look at the aesthetics of 18th century fashion.Also included is an overview of the fashion sense of the other Austrian 18th century Superstar, Wolfgang Amadeus Mozart, as seen through the Mozart family letters and discussed by music and fashion historian Carolyn Mayer."